In the first two years, the competition was coordinated by the “vision and considerable professional skill” of Art Oakes, now professor emeritus of sculpture. 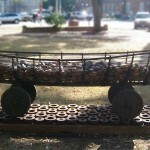 Because of his efforts the Alabama Biennial “quickly gained a reputation as an important outdoor sculpture exhibition in the South.” In year three, Oakes was honored for his efforts and a purchase prize named for him. The five works still on campus – by Andrew Arvanetes, George Beasley, Peter Flanary, Be Gardiner, and Billy Lee – won purchase awards and became part of what former Arts and Sciences Dean James Yarbrough designated “The University of Alabama’s permanent outdoor collection.” Please visit our Flickr set on the Alabama Biennial and go to Flickr’s map to find each piece’s location on The University of Alabama campus. Be Gardiner’s Angels and Flanary’s Wagon were both vandalized at different times. In 1991, the New York Times ran an article about the significant damage to Icarus and the Guardian Angels. 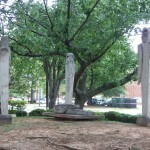 Peter Flanary’s piece was vandalized three times in 2004. 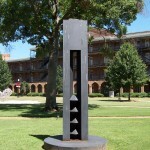 In the spring 2008 issue of our newsletter, The Loupe, we focused on public art and the danger of vandalism. See especially pages 1, 4 and 6.